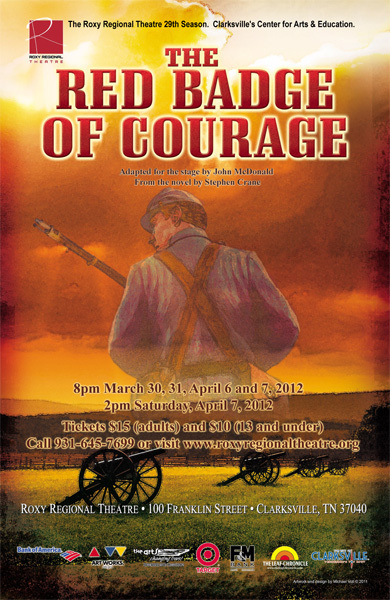 Clarksville, TN – The Roxy Regional Theatre continues its commemoration of the Civil War Sesquicentennial with a limited run of Stephen Crane’s classic tale of heroism, “The Red Badge of Courage”, opening Friday, March 30th, at 8:00pm. Eighteen-year-old Henry Fleming dreams of the thrill of battle as a young recruit, but his illusions are shattered when he comes face to face with the bloodshed and horrors of The Civil War.Telling of the experience of war from the point of view of an ordinary soldier, “The Red Badge of Courage” is considered the first modern war novel. Adapted for the stage and directed by John McDonald, “The Red Badge of Courage” stars Gregory Pember* as Henry Fleming and features a skilled ensemble cast of Josh Bernaski, Ryan Bowie, Ashley Laverty, Brandon Meeks and Colin Ryan. 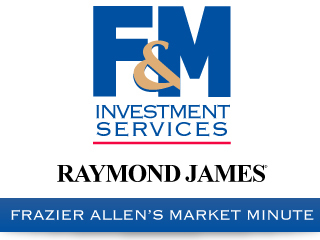 This production is made possible in part through the generous support of the National Endowment for the Arts. “The Red Badge of Courage” runs March 30th through April 7th, playing Fridays and Saturdays at 8:00pm, with a 2:00pm matinee on Saturday, April 7th. Tickets are $15.00 (adults) and $10.00 (ages 13 and under) and may be purchased online at www.roxyregionaltheatre.org, by phone at 931.645.7699, or at the theatre during regular box office hours (9:00am to 2:00pm, Monday through Friday). The performance on Friday, March 30th, is our regular pay-what-you-can preview; all tickets not pre-sold at the regular ticket price will go on sale at 7:30pm for whatever price you wish to pay.